In San Antonio, the historic birthplace of Texas independence, residents and tourists alike are scrambling to buy Fiesta T-shirts, colorful confetti-filled eggshells, and Mexican Cowboy hats so they can live it up at a citywide party this week. That party is called Fiesta in Spanish, and it attracts thousands of visitors from other states and countries annually. 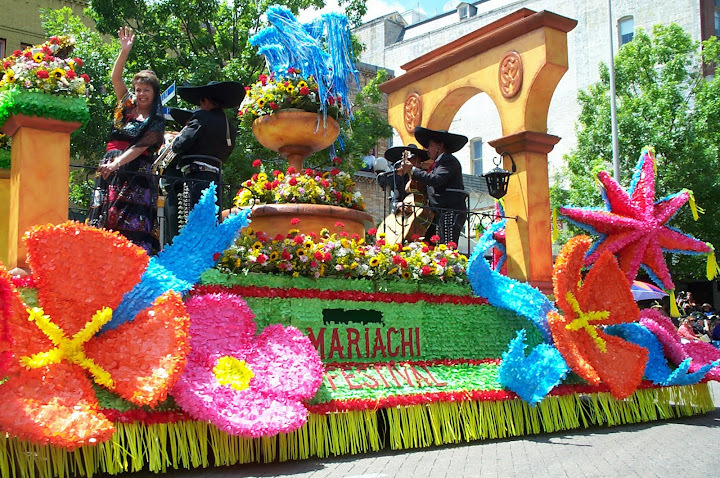 Usually held in April, Fiesta San Antonio runs from Thursday, April 18, to Sunday, April 28 this year. “Fiesta is a weeklong Festival that focuses on the Hispanic culture, since we have a huge Hispanic population here. There are different festivals held every night in different neighborhoods during Fiesta,” said Jose Perez, 27, general manager of Caruso Golf Center. “I’m a San Antonio native, and I’ve been going since I was young. Everybody knows about Fiesta. And to me, what kicks it off is Alamo Heights Night. That’s a festival held in that neighborhood,” Perez said. Krystal Jones, brand manager with the San Antonio Convention and Visitors Bureau said this city has always been a popular destination, and Fiesta enhances the already exciting experience unparalleled in the Lone Star State. “San Antonio is a popular and busy destination year round. Because of the way our leisure season and meeting season dovetail, we have a healthy hospitality business all year. Of course, Fiesta is a great time of the year to visit,” said Jones. She said the iconic celebration began as a parade to honor those who died at the Alamo and San Jacinto more than 120 years ago. That gesture was the catalyst for what has become a festive feast for the eyes as well as the stomach. “Fiesta may not get the notoriety of Mardi Gras, but it is an incredible 11 days of events that is like nothing else in the world. Fiesta has something for everyone,” said Tim Morrow, vice president of SeaWorld and Aquatica waterparks. “This year, the SACVB launched a targeted advertising and PR campaign to raise the profile of Fiesta-100 events over 11 days-11 parades and more. So certainly, it is our hope that these outreach efforts drove incremental visitation to Fiesta this year,” said Jones. 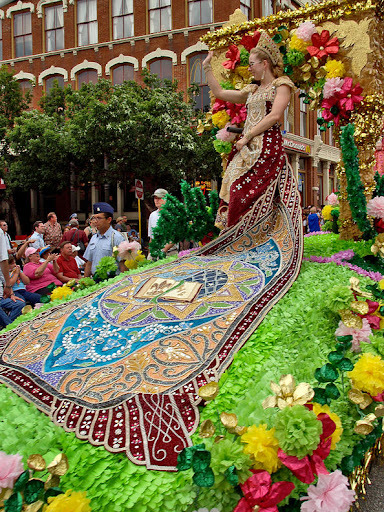 The Battle of the Flowers Parade, which was first organized in 1891 to honor those who died at the Alamo and San Jacinto, is Fiesta’s largest parade. “King Feo,” which means “Ugly King” in Spanish, earns his title by raising the most money for the King Feo Scholarship Fund. King Antonio represents the Texas Cavaliers Foundation, which supports many children’s charities. This year’s beauty queen, like those before her, definitely lives up to the “beauty queen” moniker. Miss Fiesta 2013 is University of Texas nursing student Victoria Flores. She’s also queen of the Fiesta Flambeau Parade. Flores promotes family health and fitness education programs. 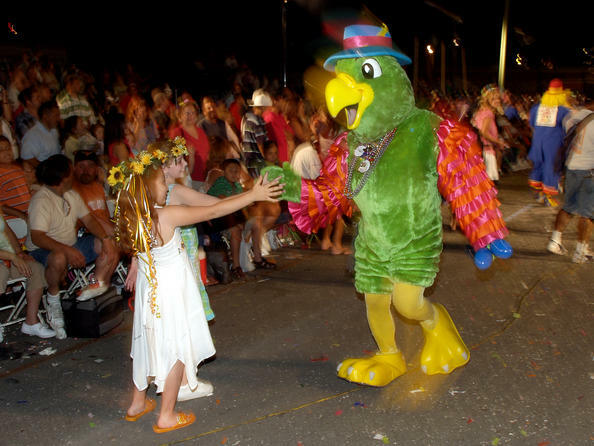 A spokesman for Fiesta Flambeau Parade Association, which sponsors a spectacular parade each year, said Fiesta is also a party with a purpose. The purpose is to raise money for charity, especially children’s charities. The nonprofit entities hosting festivals during the 10-day Fiesta must apply for permission from the city to be an official sponsor. And while some festivals are held for the benefit of children, others are fundraisers that raise money and educate the public. “I’ve done the Webb party, which is a fundraiser for AIDS, but I’ve also done “Nights In Old San Antonio,” which is one of the really big events each year,” said Brett Siebern, a 25-year-old cake decorator at HEB supermarket and bakery. He said the event goes by the acronym NIOSA. Siebern and a co-worker were responsible for the colorful cakes on display in the market’s bakery. All the cakes heralded Fiesta with “Viva Fiesta” written on top. Even the multicolored cupcakes reflected a festive spirit. Uniquely Fiesta activities include the use of Cascarones. These colorful confetti-filled eggshells are sold in super markets to attendees. The idea is to break a “cascaron” on someone’s head during or after the parades. This is a popular Mexican tradition usually reserved for Easter Sunday as well. But Fiesta would not be the all-inclusive citywide party it is were it not for myriad activities, arts and crafts exhibits, haute cuisine, and global entertainment. The best part is that everyone and anyone is welcome at all events. “Many families have generations of traditions based around events here in town, such as camping out to save their spot on the parade routes, or meeting at a certain location at events such as NIOSA. There’s a renewed energy in our city when Fiesta comes, and everyone is in a good mood,” said Morrow. 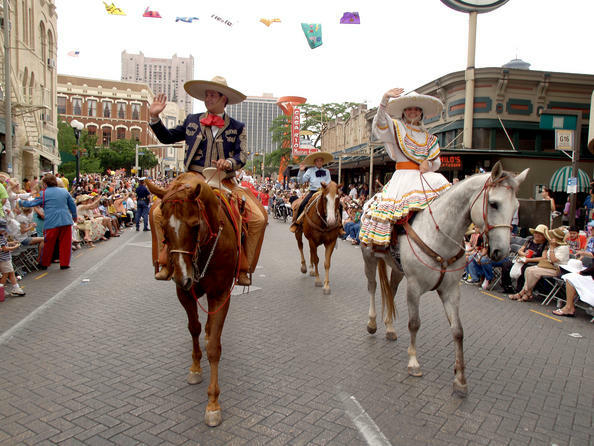 The famous San Antonio Paseo del Rio or Riverwalk, plays a pivotal role in the festivities. From this historic landmark tourists are treated to riverboat parades. Some of the elaborately decorated riverboats entertain crowds with music that often includes a Mexican Mariachi band. Since San Antonio is now more diverse in population than ever before, entertainment runs the gamut from traditional Tex-Mex and Mariachi to Country & Western, Rock ‘n Roll, and jazz. In fact, the city is emerging as a foodie paradise. Seasoned chefs, such as Jason Dady of Tre Trattoria and Johnny Hernandez of La Gloria and La Fruteria are causing a national stir with their innovative cuisine. Additionally, up-and-coming chefs are dishing up their creations at the San Antonio campus of the Culinary Institute of America. The excitement and the desire to bring families on vacation to San Antonio at this time have not been overlooked by local hotels. Many of the hotels offer Fiesta packages, which help to also boost attendance during Fiesta’s 11-day run. The celebration has been ongoing for more than a century, and it will continue. That’s why Perez said some locals don’t worry about missing some events. “If you’re a San Antonian, you still go. But you just don’t go to every event every night. But Fiesta shows off the colors and the spirit of our city, that’s what I like,” Perez said.